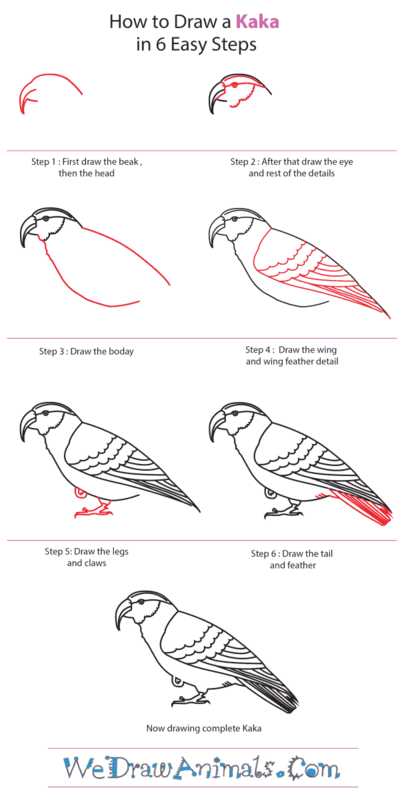 In this quick tutorial you'll learn how to draw a Kaka in 6 easy steps - great for kids and novice artists. At the bottom you can read some interesting facts about the Kaka. 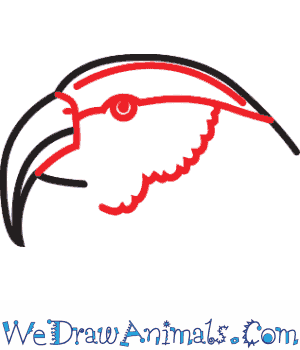 Step 1: A kaka is a kind of parrot that lives in New Zealand. 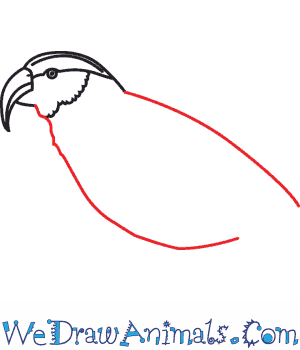 To draw one, start by drawing a short curved line for the top of the parrot’s head and add his curved beak. Add a line down the middle of the beak for his mouth. 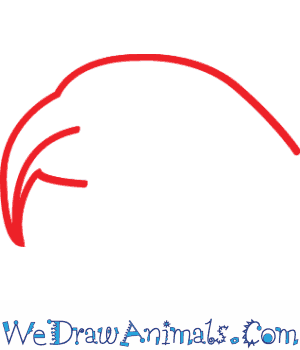 Step 2: Add a backwards ‘L’ shape line to finish the beak. 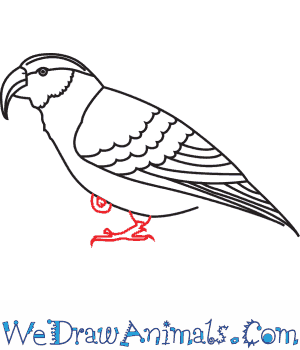 Then add a jagged curved line to make the parrot’s face. Add a small circle for his eye, and two long lines for some stripes on his face. 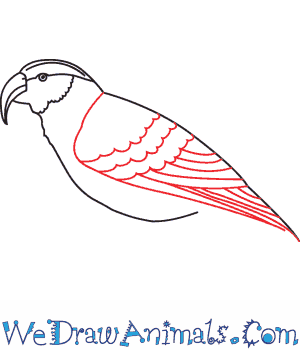 Step 3: Now draw a long curving line for the parrot’s back. Draw another beneath that for the parrot’s belly. Step 4: Draw an angled line to create a triangle shape with the back that will be the wing. Add some curvy stripes and straight lines for the feathers. Step 5: Next draw the parrot’s legs. We’ll draw one of his legs tucked up under him, so make a ring looking shape. For the other leg, draw a short haunch, and then add a clawed foot. The kaka uses his claws to help him hold onto branches and hold food while he eats. 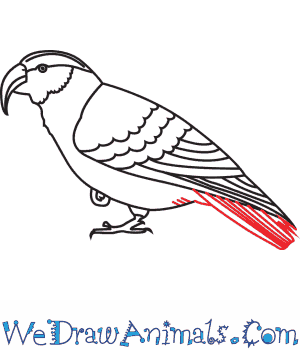 Step 6: Finally, add in some long thin lines to make the tail feathers. 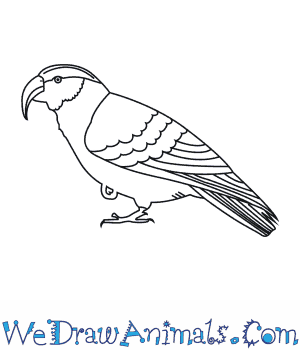 Feel free to color in your parrot. The kaka has mostly gray feathers with an orange spot on his shoulder and a yellow cheek. A Kaka is type of bird in the parrot family that is native to New Zealand. Though, there are many local zoos where you can go with your family to see birds like these! Kaka is a medium to large sized parrot that is around 45 cm in length and weighs anywhere between 390 to 560 g! It has a short tail and a thick body. Unlike some of the really bright and colorful parrots you may normally think of, the Kaka is duller in color and is typically a mixture of white, brown and grey. The Kaka has something called a “brush tongue” which originally made scientists think it didn’t belong in the parrot family because that is a common trait in the lorikeet family. The brush tongue is used by the Kaka to eat nectar from flowers, but they also eat fruit, seeds, sap, and in some area they eat sweet honeydew! There are two different types of the Kaka, depending if they are from the North Island or the South Island of New Zealand. The Kaka will use its bill like it’s a “third –leg”, to help them climb up big trees so they can reach food! Sadly, this bird is endangered – which means there aren’t that many left in the world. Don’t worry though; scientists are working hard to learn more about these rare birds in order to keep them around for a long time! That makes it even more important to learn about these amazing birds!